I had two charters today, as I often do in the Springtime, and my first trip was a story of great hopes put off to another day. The first attempt at a great fishing trip was in January and unfortunately, the 32 degree temps and the 20knt winds forced us to push the charter off to another day. So Terry, and his family came back for some fishing today and they were met with much better conditions which led to some really good fishing. Unfortunately, I didn’t take any photos (maybe they’ll hook me up) but the trout bite was really good in the New Port Richey area. We go t fish from 16-22″ and they cooperated pretty well for a solid hour. We tried to get into some of the recent good mackerel bite but the tide didn’t cooperate much. However, we got 3 or 4 nice macks and a nice sized atlantic sharpnose shark. We tried to go out that fateful day in January and after 20 minutes, I looked at them and said, “If you want to get your money’s worth, we should go back to the dock and you guys should come back in the Spring”. They agreed and it paid off today. We got several big trout and a few nice macks… and, we didn’t freeze in the process. It was actually one of the nicest weather days we’ve had all year. My second charter of the day got a little lost on the way to the ramp and we started about an hour late but it worked to our advantage as it gave the tide some extra time to come in. Good friends Bob and Bill first hit a spot that I had caught trout at earlier in the day but the bite was slow. It wasn’t the right tide for the spot. We got a few keeper trout but it wasn’t long before I felt it was time to move on. 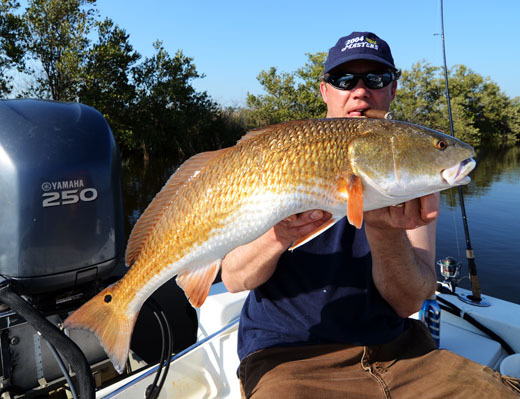 We headed north, to the land of rocks and lost lower units (the New Port Richey area is notorious for rocks that bite your boat motor), and we settled into a spot that has done well in the past for redfish on the same type of tide we had this afternoon. We first stopped and threw out baits in a trout spot but nothing was happening. So we moved closer to shore where redfish tend to roam. I started throwing out sardines as chum and it wasn’t long before the fish began to blow up on the freebies. We baited hooks and the fun began. We caught several over slot redfish on sardines 2 feet under a cork and the boat was all smiles. That’s when Bob said, “It sure would be great to get a snook as well.” Well, it wasn’t long until his bobber vanished, he reeled up and the drag started screaming. But there was no jump. Snook usually jump when hooked. 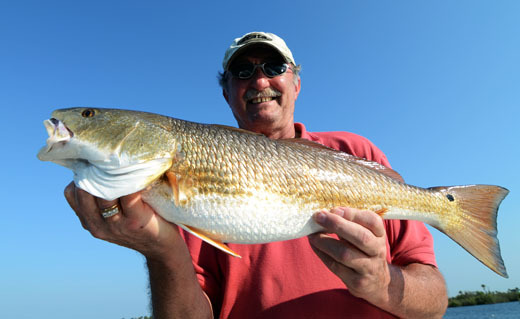 I thought he had a huge redfish until it started heading for the mangroves. Turned out that Bob’s wish had come true as a really nice 32″ snook came boat side and posed for pictures. April is a great month for catching just about anything and everything that we have available. The reds start schooling up, the trout are everywhere and the snook are feeding to get ready for their spawn. Mack’s are chasing bait and the cobia are a great surprise catch. 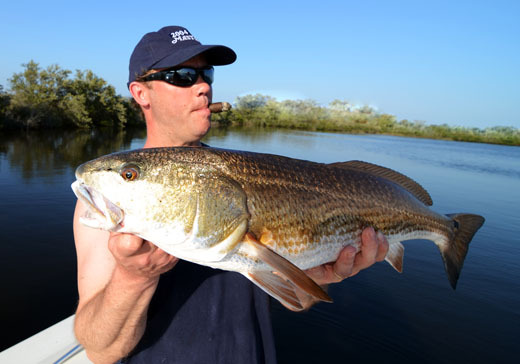 If you’re looking for a fun filled fishing adventure, you can choose no better time than now.